Scoring his fifth goal of the season came as no consolation to Cobblers forward Sam Hoskins who admitted Saturday’s 2-1 defeat to Port Vale was ‘very disappointing’. Hoskins was on target for the first time since scoring twice at Tranmere Rovers in early February, nine games ago, when he was left unmarked just a couple of yards out to prod home with only five minutes gone. 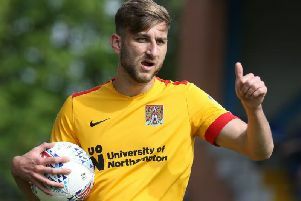 Leon Legge’s red card then looked to have put the Cobblers on course for victory, but David Worrall and Tom Pope scored either side of the break to pull off an unlikely comeback and deny Northampton a third straight home victory. “Of course I’m pleased to score but that’s just what makes it even more disappointing because we started well and dominated the game for the first 35, 40 minutes,” said Hoskins. “They then had a man sent off and within a couple of minutes they were level so we didn’t take advantage of that. It’s very disappointing, especially after last week because we wanted to bounce back and put things right. Manager Keith Curle was highly critical of his side’s performance after Saturday’s defeat, accusing some of his players of thinking the season was over, though Hoskins denied that was the case for him personally. I don’t think so,” he added. “After last week’s defeat we knew it would be tough but we felt we could still push for the play-offs. “I can’t speak for everyone but certainly in my head we were going out there to get three points and move up the table, but it didn’t happen for us. “We had those chances to get another goal and maybe we did relax when they went down to 10 men instead of pushing forward and trying to score a second before half-time. “Going in at half-time 1-1, we knew they would come back out at us and it would be tough but we were confident we could break them down.